The ancient Babylon Fortress was originally built by the Romans in the area now known as Coptic (or Old) Cairo. The fortress was built in a strong and strategic position – a canal ran through this area connecting the Nile with the Red Sea. The persecution of Coptic Egyptians led them to take refuge within Babylon Fortress, and a stroll along the length of the walls will reveal a fascinating combination of Roman and Coptic architecture. The Coptic Egyptians built a monastery as well as several churches in the fortress grounds and embedded within its walls, including the El-Muallaqa (Hanging Church) and the Church of St George. The towers of the fortress stand at almost 10 meters tall and are more than 30 meters in diameter. The fortifications have been altered and expanded upon by a number of emperors throughout the centuries. The Babylon Fortress is located in the heart of Old Cairo. It’s a short walk from the Mar Girgis metro station. Done the Great Pyramids? Devote the day to Cairo’s other highlights on a private trip to the Egyptian Museum, Coptic quarter, Islamic Cairo and Khan El-Khalili bazaar, with a qualified Egyptologist guide. Traveling between the sights by air-conditioned minivan, explore the Egyptian Museum, home to some 165,000 artifacts including Tutankhamun’s treasures. Discover the historical mosques of Islamic Cairo, including the Mohamed Ali Mosque at the Citadel, and see the Hanging Church and more in Coptic Cairo. Finish at the Khan El-Khalili with time to peruse the captivating lanes and stalls. Visit Cairo’s religious landmarks on a full-day tour to the city’s most important Coptic, Islamic and Jewish places. Learn how the Christian Holy Family took shelter on the site of Saints Sergius and Bacchus Church, explore the Church of Saint Barbara, and see the gilded icons that adorn the Hanging Church. Enter a synagogue built where baby Moses was found and eat lunch at a local restaurant; see Cairo’s most important mosques then take in sweeping views of the city from Saladin’s 15th-century citadel. See the best of Northern Egypt without breaking the bank with this three-day private tour. You'll see sights such as the Great Pyramids of Giza, the Sphinx, the Egyptian Museum, and the multiple Coptic sights in Old Cairo, not to mention Alexandria's most interesting attractions, including the Catacombs and the Old Lighthouse. Plunge into the ancient history of Coptic Cairo on a private full-day tour led by a knowledgeable guide. Absorb the historical charm of Old Cairo, an atmospheric enclave home to landmarks like the Hanging Church and the Roman ruins of the Babylon Fortress. Descend to the crypt of an archaic Coptic church; feast on typical Egyptian dishes like Koshary at lunchtime; and head inside the colossal mountain, El Moqqatam, to see the holy inscriptions carved onto the stone walls. Receive undivided attention from your guide on this educational private tour. Experience the many historical faces of Cairo on this revealing full-day tour. Traveling by air-conditioned minivan, visit the Egyptian Museum, home to the world’s largest collection of pharaonic treasures. Admire star attractions such as Tutankhamun’s funerary artifacts and gold death mask; and then explore the hilltop Citadel of Saladin, built in 1183 to defend against Crusader armies. View the fortifications and buildings, including the Mosque of Mohammed Ali. Finally, dive into Old Cairo to enjoy lunch at a local restaurant, and explore its famous churches and Synagogue of Ben Ezra. Egypt is home to some of the world’s most ancient treasures, with historic pyramids dating back to the days of the pharaohs—but sightseeing solo means missing the sites’ hidden secrets. On this organized tour, begin with pickup at your Cairo or Giza hotel, and visit the major pyramids of Dahshur, Giza, and Saqqara. Visit the Egyptian Museum in Cairo, and gain insight into an ancient civilization lost in time. Cast your flashlight into Cairo’s ancient, medieval and late Ottoman eras on a private, full-day tour to the Giza pyramids, Hanging Church and Mohamed Ali Alabaster Mosque. With an Egyptologist guide, explore the 4,500-year-old pyramids, Great Sphinx and Valley Temple at the Giza Plateau. After lunch at a local restaurant, fast-forward to early medieval times at the Hanging Church, one of Egypt’s oldest Coptic churches, famously built above a Roman fortress. Finish at the hilltop Citadel of Saladin to admire the magnificent, 19th-century Alabaster Mosque, a symbol of Ottoman-ruled Cairo. Visit the Giza pyramids and four of Cairo’s atmospheric religious sites with a private guide on a revealing day trip. During your private 8-hour tour, see Giza’s pyramids and Sphinx, and then head into Old Cairo to explore the Hanging Church, Ben Ezra Synagogue and Church of St George as you uncover their age-old history. Lastly, visit Cairo’s Moqqatam area to view the stunning Cave Church, a 20th-century Coptic Christian church built into rocky hills. Your tour includes a tasty Egyptian lunch and hotel pick-up and drop-off. Combine visits to the Pyramids of Giza, the Hanging Church, and the Alabaster Mosque with personalized attention on this private tour from Cairo. With a dedicated Egyptologist guide to shed light on the facts, learn about three historical periods that led to the construction of these three marvels: the Pharaonic, the Christian, and the Islamic. All entrance fees, lunch, a camel ride, and round-trip private transportation from Cairo included. Retrace the steps taken by the Holy Family thousands of years ago on this private, 4-hour tour of some of the oldest Christian churches in the world. 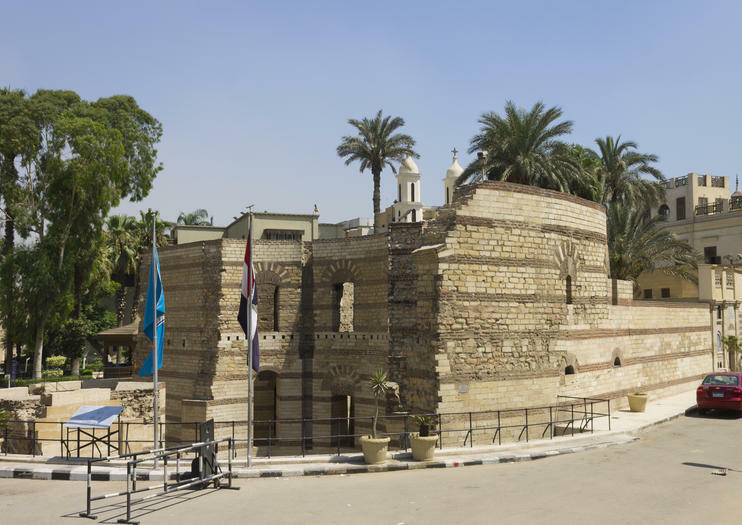 Visit the Coptic Cairo museum, featuring a collection of ancient Egyptian Christian artwork, objects and manuscripts. See the Babylon Fortress, the Coptic Museum, the Hanging Church, the Greek Church of Saint George and many other Coptic churches and historical sites. Also, explore Islamic Cairo, known for its world-famous mosques and monuments. All necessary entrance fees, plus a Cairo hotel pickup and drop-off are included. Full Day Tour Visiting Coptic and Islamic Cairo. you will visit Coptic old cairo which is one of the places visited by the Holy Family where the spiritual impact of their presence is most felt still. you will also visit the Hanging Church which is one of the most historic places.you will also visit Ben azra synagogue where baby Moses was found.you will enjoy visiting Fort of Babylon which is a destination of Pilgrimage not only for egyptians but for all Christians all over the world.you will also visit Omar Ibn El Aas mosque.it was built in 624 A.D by the islamic leader Amr Ibn El Aas at el Fustat area.also you will visit Mosque and Madrassa of Sultan Hassan.It is one of the biggest mosques which is built in 1356 A.D by el Sultan Hassan.also you will enjoy visiting Al Rifai Mosque which is One of the oldest and most architectural mosques opposite to the Mosque-Madrassa of Sultan Hassan built in 1361.then you will visit Salah El Din Al Ayouby Citadel where you can visit Mohamed Ali 's Mosque which is one of the most famous mosques. Step back in time to explore the ancient civilizations and Coptic Christian history of Egypt during this flexible-length excursion. Discover the more than 250,000 artifacts from ancient Egypt at the Egyptian Museum, a sprawling complex that is also home to the gold mask and jewelry of King Tut. Then walk amidst the ancient Roman fortifications and ancient Coptic churches of Old Cairo, stopping to see the Coptic Museum, Hanging Church, Ben Ezra Synagogue and much more. Your trip also covers a guide, round-trip coach transport from your hotel, entrance fees and lunch. Get up close to the major pyramids of Dahshur, Saqqara and Giza on this private 2-day tour, led by a qualified Egyptologist. Then see the sights of Cairo, including the antiquities of the Egyptian Museum, atmospheric mosques and churches in the Citadel, and Khan El Khalili Bazaar.